#FreeJoel Lets stop the nazi tramp of boots together! “Antifacsism is always self-defence”, according to the participants in the solidarity campaign with the antifascist who was detained in Stockholm after the nazi attack on December 15, 2013”. sweden 2013: The police have created records of Romani nomads based on their ethnicity. The swedish migration board takes decision after decision for deporting people to countries which are at war. Cops behave in a pure racist way during police controls in the subway (the REVA project). At the same time in Europe fascism is rising again and nazi pogroms against Romani villages take place in Eastern Europe. We see all these developments and we hear a tramp of boots. Within this context, a few brave citizens in Stockholm’s southern suburbs showed moral courage by organizing a manifestation to state that “this shall not happen again”. 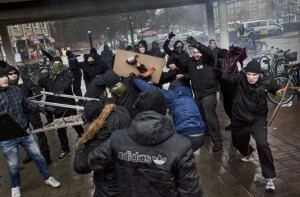 A few hundred locals joined the demonstration against the unidentified nazi activity in Kärrtorp on December 15. Students were fed up with painted swastikas on their school. Families with children were tired of being afraid of the fact that black dressed nazis carried out military-like exercises in the local sport hall. 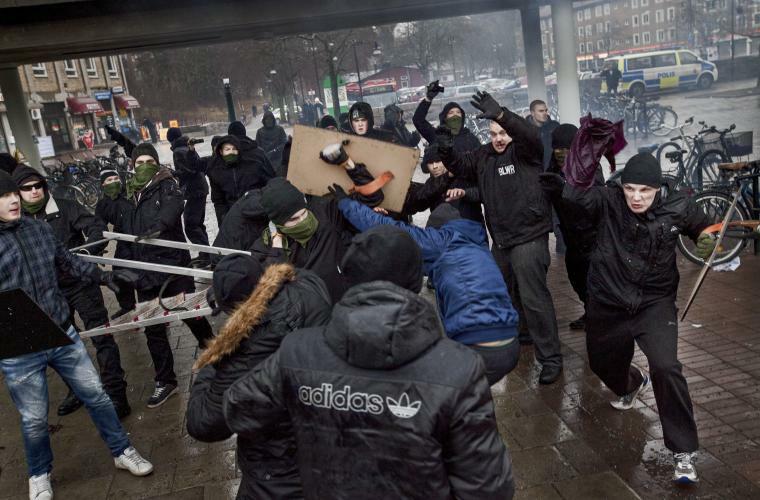 During this demonstration, the nazis from the organization Svenska Motståndsrörelsen [swedish resistance movement] made the decision to attack a totally peaceful manifestation of baby carriages with knifes, bludgeons, glass bottles, fire-crackers and sparklers. The antifascists that were there managed to push back the attack. Probably many of them went down the memory lane to their youth during the 1990s when several refugee camps were set on fire in sweden, they remembered the tortured face of John Hron before he was drowned in a lake, the fear for the serial killer of immigrants Laser-man because they also had dark hair. They probably saw these memories turning into reality in front of them again before they decided to take action and defend the demonstration using necessary violence to protect themselves and several families with children from not being assaulted by sweden’s most militant nazi group. That day no tramp of boots was heard from far away. The nazis were standing in front of them. We have heard the tramp of boots before. But for once again, we realize that the oppressed need to answer the question regarding violence and not the oppressor. Is it right to protect yourself by using violence? We claim that self-defense against nazi assaults can only be defined as self-defense. The nazis attempt through attacks to scare and silence us. We have seen it before. 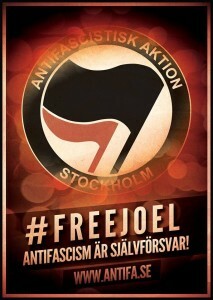 Probably, Joel came to Kärrtorp that day, on December 15, because he was tired of this sort of violence. Because he was tired of explaining to his children that one shall be afraid and aware of the nazis, especially if this person bears a dark skin. Tired of explaining why people in sweden are separated. 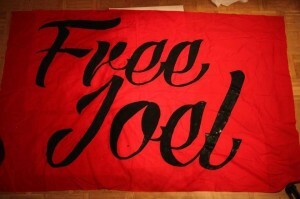 Joel was arrested some days after the events in Kärrtorp. He is detained in isolation for more than six weeks now. Joel is a father, a colleague, a friend and a comrade. He was forced that day to use violence for defending himself. Because he had heard the tramp of boots during the whole of his life and he did not want that his children will need to grow up in a country where refugees’ camps are set on fire. He did not want to see this happening again. We know that you have also heard the tramp of boots and together we will show that our solidarity is greater than their hatred. 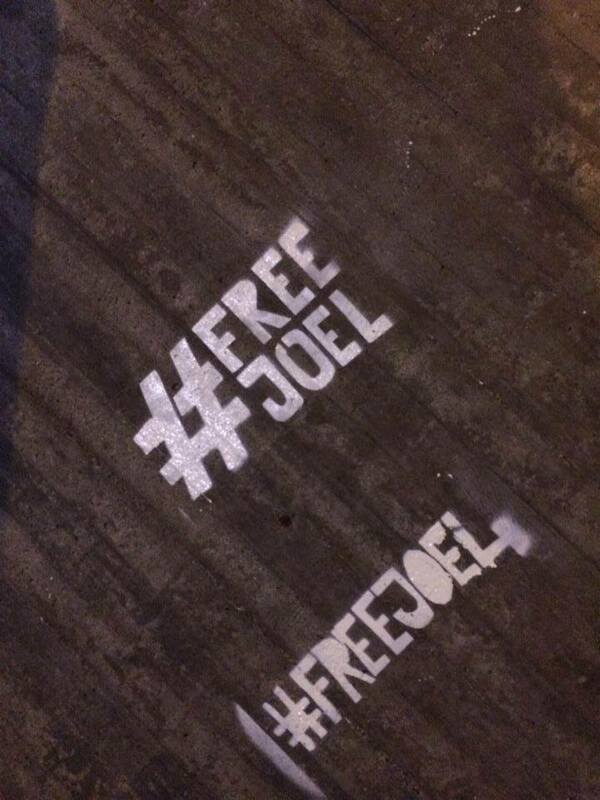 Release Joel! Antifascism is always self-defense. We should never let it happen again. 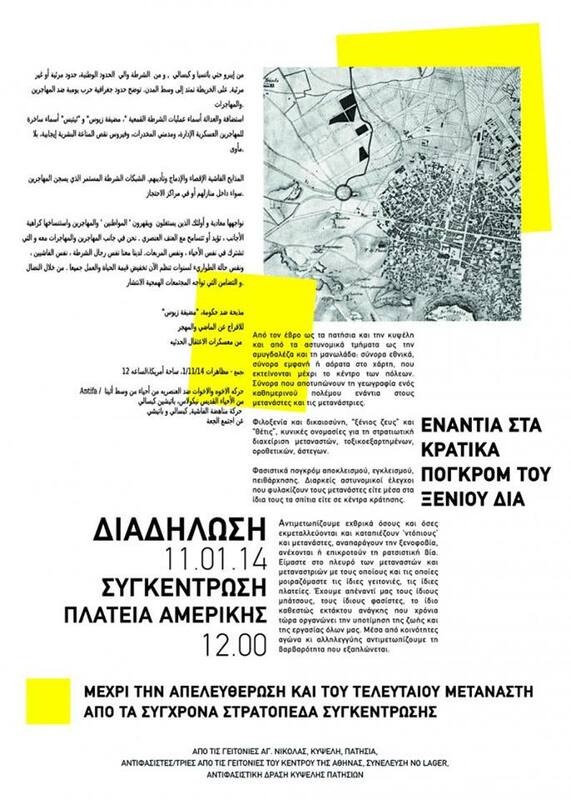 “When on Saturday, the 28th of December 2013, we went out for a political intervention in the metro stations against the state-organised pogroms of “Xenios Zeus” and the detention centres for immigrants, we already knew who we had against us. A state that continually pushes towards totalitarianism and implements a racist immigration policy, conducted as a military operation. A police that not only legally enjoys excessive powers, but has the de facto right to ignore the law anytime and whenever it feels like it. The fascist/racist part of greek society which, to the extent that it coordinates with state policy, believes that it can say and do anything it wants against immigrants with absolutely no cost. We also knew who we wanted to meet. Those who feel the need to confront the barbarism that is spreading, those who due to their position are in the receiving end of this violence. 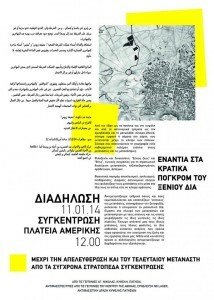 For this reason, a number of collectives of the area and of the centre of Athens decided to organise a number of similar interventions which will result in a demonstration on the 11th of January 2014. For this reason, we made sure that the texts, posters and leaflets that we were handing out were in 7 different languages. For this reason, we chose the multi-racial neighborhoods of Patisia, Ag. Nikolaos, Victoria as the area of our intervention. Neighborhoods in which there is a daily manhunt of the police against immigrants, and in which the holy alliance of cops/fascists/mafia and the racist “citizens’ committees” has written the most “glorious” pages of its recent history. Pogroms, racist attacks, mafia activities, constant police controls, detentions and arrests with colour as the only criterion, torture in the police stations.